This is the seventh budget cycle in which the Alliance has formulated a budget request of Congress (“our ask”) and the process seems to grow more difficult each year. This is, in part, because our “ask” is context-sensitive. On the one hand, we want to ask Congress for a large increase, knowing that FDA’s expanding mission and responsibilities can justify substantial additional funding. A higher number also stretches the discussion in Congress and tends to pull the eventual appropriation levels upward. On the other hand, we have to provide balance in our request … Congress rather roughly dismisses advocacy groups that ask for far more money than is possible. The Alliance Board has now reviewed the President’s request and considered the budget environment. Their conclusion is that the Alliance should ask Congress to provide FDA with $2.60 billion in budget authority (BA) appropriations, about $40 million above the President’s FY 14 request. This would be a 4% increase for the agency over FY 12. Most of the additional $40 million is intended to restore cuts (“base adjustments) proposed by the President. These cuts are agency-wide and are the consequence of the President advocating more than $80 million in new initiatives, but only providing about $50 million in net new monies. For example, under the President’s budget proposal, food safety is supposed to receive a $43 million increase, but the actual increase at CFSAN and CVM is about $29 million (–$14 million). The medical product centers (CDER, CBER, CDRH) are not slated for any increases and the program adjustments will decrease their budgets by about $16 million. 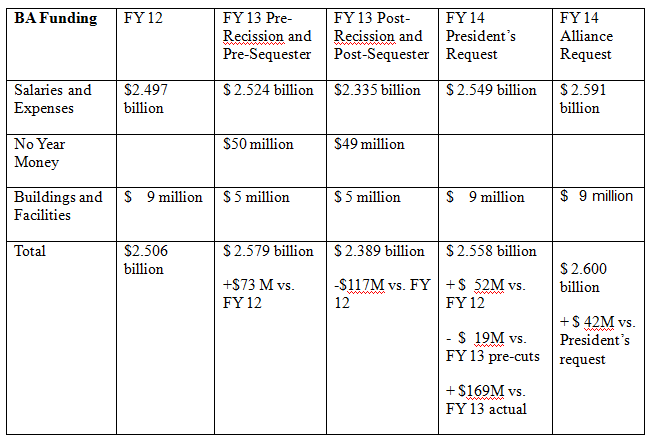 Here is the Alliance’s request compared to FY 12, FY 13, and the President’s Request for FY 14.